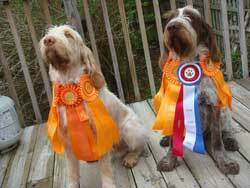 Thank you for your interest in Shorewinds Hunting Dog Training, we specialize in training all pointing breeds. At Shorewinds our expert trainers offer upland dog training tailored to fit clients and their dogs. We specialize in AKC hunt test training for Junior, Senior and Master class levels; training the hndler/dog in the field to prepare for the unt test. We train hunting companions, for those who want to hunt their dogs in the field with confidence and control. Please give us a call at (856) 327-4949 to discuss your dog's training needs. Lead trainer Jerry Lynch has 35 plus years of dog handling and training experience. His advanced education through years of seminars has helped make Jerry into a top trainer. Shorewinds trainers on staff each have training seminars to their credit. 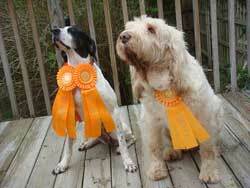 Our trainers have been training and handling doges for twenty plus years. After each session, the handler and trainer discuss the session results. Progress is monitored between trainers, to assure awareness of the progress of each dog. All training is done in hourly sessions, with the dog and handler working together. Phone for hourly rates. Birds used for training will be billed at an extra charge. At Shorewinds we don't just stop with the intial training, we offer our expertise throught the life of your dog. Our staff is always availalbe to offer advice to assist you in working through problems you encounter, post-training. We are a phone call away, and no question can be answered until it is asked. Shorewinds offers on site boarding kennels. Daily weekly, and monthly boarding for any dogs trained at our facility is offered. Phone for current rates. If this is what you are looking for then let Shorewinds Hunting Farm training your next bird dog, with a few months of planned and well accomplish training. There are many dogs with the potential to become great bird dogs. Unfortunately, there are precious few who have been given the proper training to reach their potential. Not every dog is the same, and not all will respond to the same training styles. Here is where most trainers fall flat on their face. If your dog doesn't conform to a set regimen, he may end up scared, confused, and untrained. It has often been said that dog training is as much art as science. It is this ability to deviate from a set program and cater to an individual dog’s needs that separates us from an average trainer. 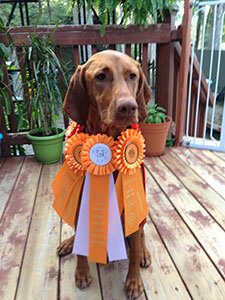 Jerry has been a tremendous instructional trainer not only for my year old Vizsla (Amber), but also for me. He has taken a young dog and novice handler through the stage of acquiring an AKC Junior Hunt Test title, providing skills and knowledge at every step for both of us. His dedication, patience, knowledge base, and skills set has been deeply appreciated. I look forward to working with him toward both Senior and Master Hunt Test titles for Amber as well as for any of my future Hunting Dogs. "My husband and I have been training and hunting at Shore Winds for a little over a year now. Jerry has shared with us his knowledge and experience of gun dog training, and has successfully guided us to Senior Hunter level. With Jerry's continued support and guidance we are now on our way to Master Hunter. Jerry and his wife Pat, and son Jason, have always been available to us for advice, birds and training. Working with Jerry and his family continues to be a rewarding and pleasurable experience. We are thankful to be a part of the Shore Winds family." and GCH CH Penn-Woods Red Angus SH "Angus"
"Jerry has to be the best hunting dog trainer. He has a real understanding of canine behavior, and has a unique ability to assess each dog so he can customize the training. He does not use a cookie cutter approach, one type of training for all dogs. Jerry handles each dog with care, uses positive reinforcement, and makes sure the dog is having fun. He not only trains the dog, he also trains the owner. Needless to say, based on my own experience, Jerry has a lot of patience. Jerry trained my German Wirehaired Pointer, Nate, and me to prepare for AKC Hunting Trials. From the time Jerry introduced Nate to his first bird to the preparation for his first Hunting Test, Jerry was patient, made it clear what we had to do, and worked with us to make sure we were successful. In a short 4 month period, Nate went from a green hunting dog to earning his Junior Hunting Title. We are now training with Jerry to get ready for his Senior Hunting Test. Jerry is a real professional, committed to do whatever it takes to help you and your dog, and makes training fun for both you and your dog. Jerry is truly one of a kind."